In the course of 2000 years, the Church has developed a great variety of spiritual traditions and ways of living out the command to ‘pray at all times’. This Lent, five guest speakers (plus our own Fr Daniel) will share with us insights from their wealth of experience in their own religious orders that will help us in our own times of prayer. These talks are sure to be a help in strengthening our own Lenten practice of prayer. Talks take place on Saturdays at 11:00 in the Oratory parish centre and are open to the public. Tea and coffee available before from 10:30. 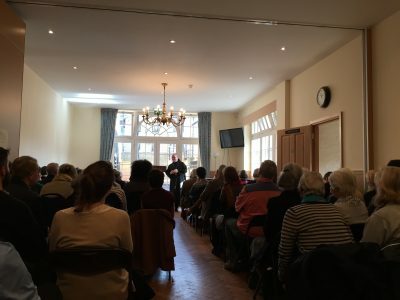 We had a full house for Abbot Cuthbert Brogan's fascinating and entertaining talk on Benedictine spirituality. Our next speaker is our own Fr Daniel, on The School of St Philip: The Spiritual Life of the Oratory. St Philip never really meant to found anything; the Oratory just happened in response to the needs of his age. The Oratorian priests and brothers, established to serve the laity who attended the meetings of the Oratory, still promote a spirituality designed ‘to make people saints in their own homes’. 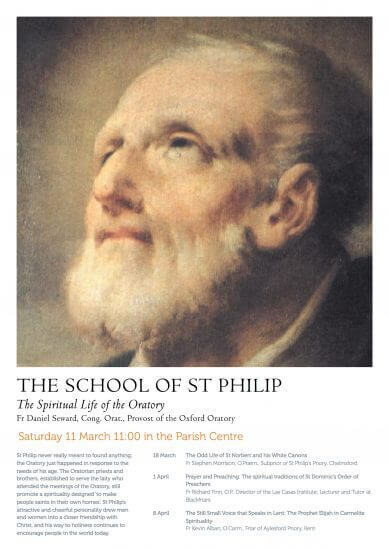 St Philip’s attractive and cheerful personality drew men and women into a closer friendship with Christ, and his way to holiness continues to encourage people in the world today. Full details of all the talks are available in the Lent, Holy Week and Easter booklet. Printed copies are available at the back of church.